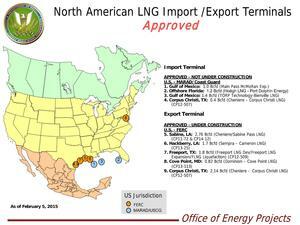 Port Dolphin LNG import to Florida from Louisiana and Texas? Our old friend Port Dolphin is back asking LNG import competing with or displacing Sabal Trail’s fracked methane pipeline, this time possibly shipping gas across the Gulf of Mexico from U.S. LNG export facilities. Florida does not have indigenous gas supply and historically has been served by two interstate natural gas pipeline with a third one planned, Sabal Trail (see Daily GPI, Oct. 24, 2013). Recently announced is a related north-to-south intrastate pipeline project (Florida Southeast Connection) (see Daily GPI, Oct. 10). Rather than turn its LNG import project around to export liquefied U.S. gas — as other would-be import terminal developers/operators have done — Port Dolphin, which is a unit of Norway’s Hoegh LNG AS, still wants to make a go of importing LNG. It told FERC the project could even regasify domestically sourced LNG from the Gulf of Mexico, for instance.